Tokyo robotics company Softbank is getting ready to launch its latest design - a robot called "Pepper" which can not just recognise human emotions but react to them too. The robot was shown off to Japanese journalists on a stage at a Tokyo theatre on 18 June 2015. It rolled onto stage, talked to celebrity guests, did a little dance and sang a birthday song. It also showed off its emotional programming. 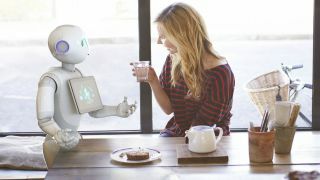 Pepper is equipped with code that allows it to converse and respond to what you say. It detects joy, surprise, anger, doubt and sadness from facial expressions, body language and the words that its owner says. If it thinks you're feeling glum, for example, it might try playing your favourite song. It also learns over time to adapt to his owner's personality and tastes. Pepper can remember faces and is programmed to be happy when given attention but irritated and depressed when it's not. Softbank's CEO, Masayoshi Son, said that it was inspired the Japanese cartoon character Astro Boy, who lacked a heart. He added that the world already has robots that help with manufacturing. "Our vision is to offer a robot with love," he said. If you need some of that robotic love in your life, Pepper will go on sale from 20 June 2015 for a cost of 198,000 yen (about $1600 or £1000). Sales will be initially limited to Japan, expanding overseas in 2016.